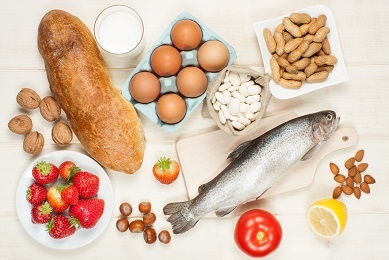 Food allergies affect 1 in 13 children, but oral immunotherapy (OIT) can help. With OIT, the patient receives small amounts of a food allergen to decrease their sensitivity, gradually increasing the dose over the 6 months. OIT is a very successful treatment that sees over 80% of patients able to eat foods that once threatened their health within 6 months of treatment. This form of therapy involves the exposure of allergenic foods to the patients, so there is a risk of anaphylaxis. However, our staff carefully supervises all patients during this process, and all treatments and test are overseen by a Board-Certified Allergist. Initial dosing: seven to 13 doses are given in a single day (occurs during a four-six hour time period under physician supervision). Build up dosing: the dose is increased incrementally every 1-2 weeks under observation until the maintenance dose is reached, usually over a period of about 6 months. Maintenance dosing: doses are taken daily for years depending on the physician’s recommendation. Along with taking the maintenance doses, patients get long-term resistance and the ability to eat the foods that previously threatened your health. What foods does OIT cover? What is the Desired End Result of OIT? The primary goal of OIT is to be able to consume a full serving of the allergen without experiencing any adverse reaction: 1 glass of milk, 1 egg, a handful of peanuts, etc. For patients who know what they're allergic to, we're able to start OIT after the initial consult with our physician. For patients who aren't exactly sure or haven't had a reaction to a certain food, we use an oral food challenge to determine the severity of allergies and food sensitivities. Food challenges are designed to understand each patient's tolerance to their food allergy and lets our physician know where and what foods to start on OIT. For any other questions you may have about OIT, check out our OIT FAQ. If you think OIT is the right choice for you or your child, or would like more information, call our office or contact us today to schedule a visit with our allergist!